are experts at helping you decide which machine is the right one for you, and then we'll also teach you about every aspect of your machine! Quilting Treasures and more. We have the largest selection of sewing, quilting, embroidery, and embellishment threads in the area. BERNINA trained technicians are available on-site in both of our stores and work on most brands of home sewing and embroidery machines. Our other classes are open to owners of all brands of sewing and embroidery machines. If you are already a BERNINA owner new to our area and store, ask about our adoption program for owner's classes and warranty work on your machine. We are dedicated to helping you be successful in all of your quilting, garment, and fiber arts endeavors. Our staff is comprised of skilled service technicians, garment sewers, quilters, and instructors with years of experience, training, and patience. The Presser Foot, you are purchasing much more than a sewing machine—you are getting the best sewing system available. 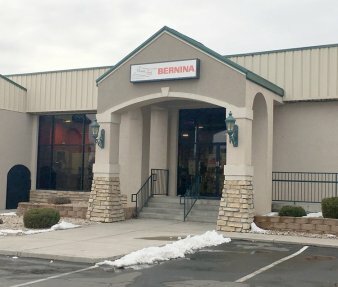 We'll provide you with outstanding service, training, and the support that you deserve for as long as you own your BERNINA. This is our promise to you! Open Monday through Saturday, 10am to 5pm and Thursday 10am to 6pm. See the Longmont Calendar for holidays that we are closed. See the Fort Collins Calendar for holidays that we are closed. Road, between South Timberline Road and Mcmurry Avenue. (the East side of Delany).